Not sure why the recipe was written this way, but here’s the card upside-down, so you don’t injure yourself trying to stand on your head (click to enlarge it). Garlic powder and parsley together make a kind of instant persillade, an ingredient we discussed in the recipe for Yesterdish’s spaetzle. Combined with the cheese and cornmeal, they should form a nice crust on the skin. A bit of advice: check the breast after about 40 minutes. If it’s 155-ish degrees inside, take the breast out and let the carryover heat take it over 160. The dark meat won’t suffer much from additional cooking time, but the breast might. 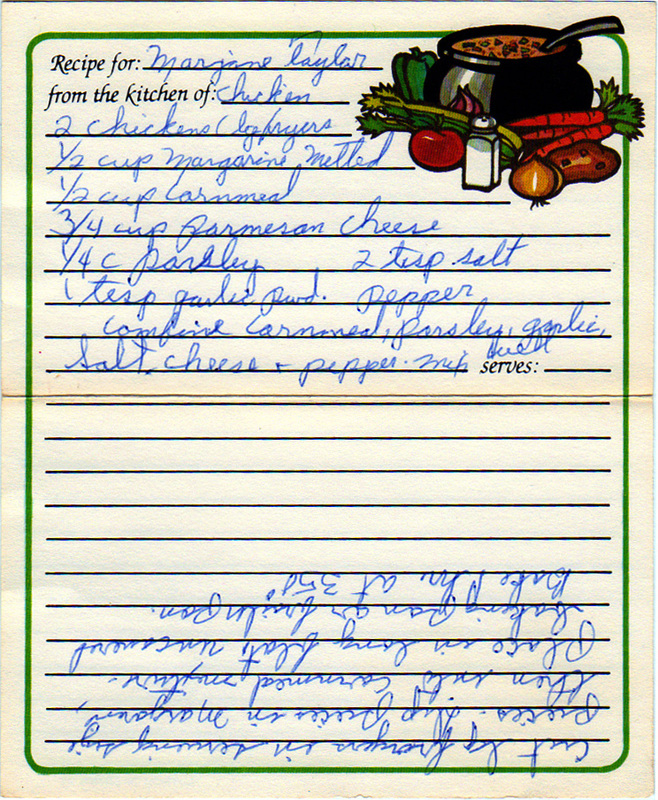 I do feel for the recipe author in that having pre-printed lines on the card can be annoying–I’m sure they felt it was strange to read, “From the kitchen of chicken.” Presumably most chickens don’t have chicken recipes in their henhouses. Or any other recipes. Because they’re chickens. Combine cornmeal, parsley, garlic, salt, cheese, and pepper. Mix well. Cut large fryers in serving-size pieces. Dip pieces in margarine, then into cornmeal mixture. 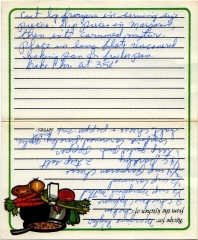 Place in long, flat, uncovered baking pan or broiler pan. Bake one hour at 350 deg. A few days ago, our Aunt Vittoria passed away. She was 87 years old.